Rockman Corner: The End of Ryuusei: Planned All Along? If it is the end.... hence the word IF, PLEASE PLEASE PLEASE... find Subaru/Geo's dad, that will finally make him shut up. Actually Protodude your wrong. If it were true, then its only logical that the anicient items were to coem first. thats the apprioate order of course. I don't know. I haven't seen any conclusive evidence saying that this is the last one. That one post where it said it was "reaching a climax" didn't really say that at all... If it is the last one, I'd like to see the return of EXE, or some tie-ins to the EXE series. Maybe time travel, where lan comes to the future, or we go in the past... You guys think Warrock is leaving? 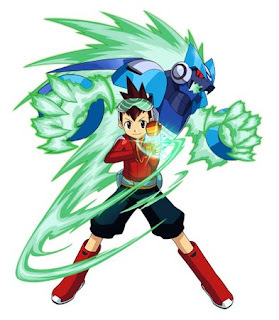 Cause I keep reading things like, "Warrock is still satying with Subaru..." and the Hunter VG thing makes it look an awful lot like Warrock doesn't play much of a part... Meh, never really liked him anyway. @Anon2: The whole "reaching a climax" thing is awfully similar to the way EXE 6 was being hyped. So, it's possible RnR3 may be the last or not. That's a good point, Protodude, but personally, I doubt it's the end. I wouldn't be surprised to see at least one more game, especially since RnR follows EXE's conventions so closely, thus (from the fans' perspective) Capcom could get away with making up to six games. Plus, Capcom might not be able to resist making more games if RnR3 does well. Nothing's definite until someone sees "End" on the last screen of the credits. I'll be sad to see the series go if the third Ryuusei really is the last in the series. They're very entertaining exploring and collecting all of the Battle Cards and making Brothers over Wi-Fi. Yes, that's what I was saying. Climax also means middle. The EXE series was most definitely not boring. Some people are just fans of the EXE gameplay. While I am a fan of the gameplay-- a BIG fan, I'm much more a fan of the character design and the plot. Which makes one wonder whether it's the characters and universe of the EXE games, or just the gameplay that haters don't like. I think RnR is boring compared to EXE... Plus the character designs are "meh"